Birding is so much fun. You just never know what you will find, see happen, and be able to document. As I was returning home recently, I spotted a Bald Eagle high in a sycamore tree right beside the highway. I turned the car around as quickly and safely as I could and parked well away from the bird. Just as I exited my vehicle, the eagle flew low across Cooks Creek and landed in a pasture field. I was in luck but didn’t know just how fortunate I would be. 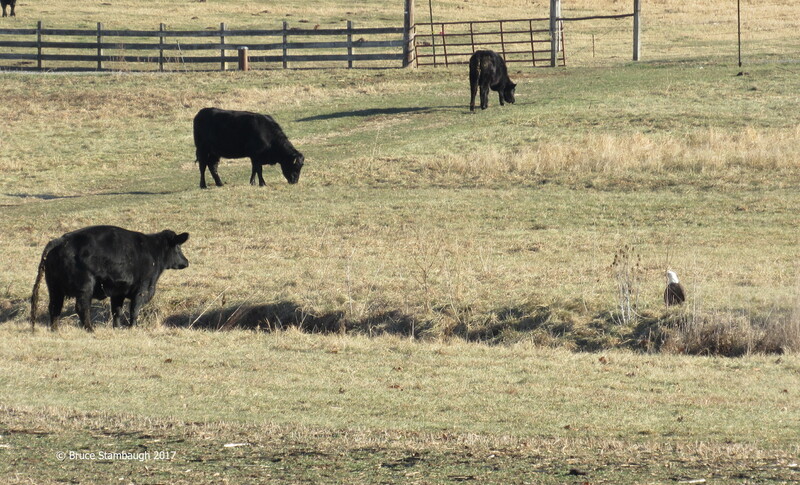 As I hurried along the roadway, I noticed a black Angus steer move towards the eagle. The steer was about half-way between the eagle and me. Soon it broke into a gallop, which drew the eagle’s full attention. The steer stopped at the west side of the creek bank opposite the eagle on the east side. If they had a discussion between them, it was short. The steer bounded down the embankment and towards the eagle. Of course, the eagle flew straight back for the sycamore tree. At the last second, the magnificent bird changed course and zoomed back over the steer and out of sight. Whether you are a birder or not, this indeed was a once in a lifetime occurrence. I’m exceedingly glad I got to see and document it. “Standoff at Cooks Creek” is my Photo of the Week. The frantic knock on the front door got my attention. In my dash down the hall and to the front entrance, I wondered if someone was in need of help. Had there been another crash on our busy county highway? When I flung open the door, there stood my neighbor smiling. My negative concerns immediately vanished. 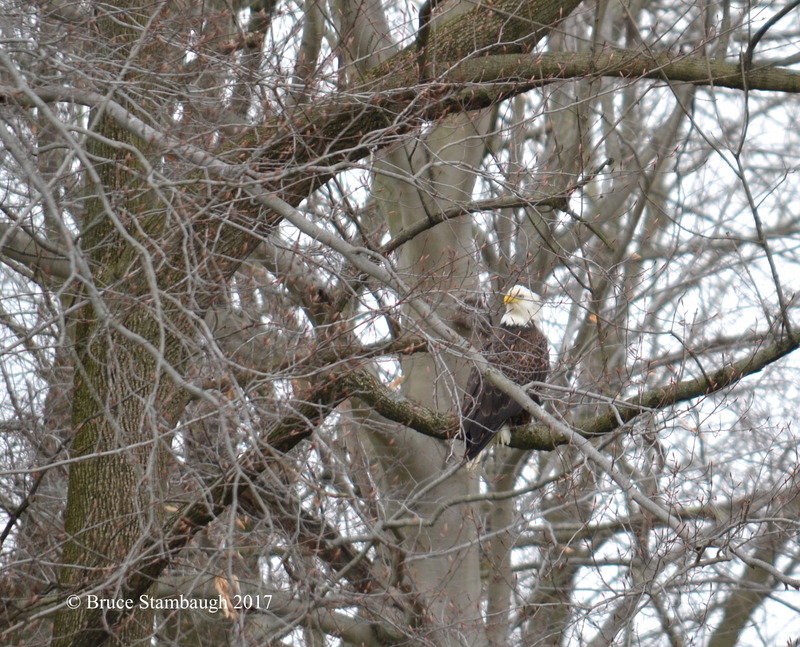 I shook Doug’s hand as he excitedly exclaimed that an eagle was sitting in a tree across the road from his house. I quickly retreated to my office and grabbed my camera with the long lens. As we rushed over to his front yard, Doug told me how he came to see our nation’s icon. As he drove over the hill south of our homes, Doug saw the eagle circling overhead and then dive to the grass on the east side of the road where a roadkill raccoon laid. As his car passed the big bird, it flew to a branch low in a thicket of trees only a few yards away. I concealed myself as best I could behind a large tree trunk at the corner of Doug’s yard. The camera’s shutter clicked away as other drivers zipped along the road unaware of the sight they were missing. The many branches in front of the eagle made it rather difficult for me to focus the lens. When I looked down at the camera to check the quality of the shots, the eagle flew east, leaving his intended meal behind. “The Eagle Has Landed” is my Photo of the Week. I sat on the picnic table for nearly two hours admiring the scenery and serenity all around me. I hadn’t planned on staying that long. Life’s events have a way of altering your plans. The previous day I had safely delivered our granddaughter back to her parents in Virginia’s Shenandoah Valley. On the way home, I wanted to hike up the enchanting Seneca Rocks, one of the best-known landmarks in West Virginia. I had previously taken several photos of this fascinating rock formation that juts straight into the sky. But I never had time to climb it. I did this trip. The switchback trail to the viewing platform at the north end of the ancient rock outcropping extends a mile and a half. In that short distance, the trail climbs 1,000 ft. The cool morning was perfect for my adventure. An overnight cold front had cleared out the heat and humidity. The trailhead began at the restored home of an early pioneer settler. A tour of the Sites homestead is informative and interesting. I could have been satisfied to watch the dozens of butterflies that flitted around the bee balm. But I had come to hike. I only walked a few yards when I came to a pedestrian bridge that crossed a delightful river, the South Fork of the North Branch of the Potomac River to be exact. The stream’s lengthy name didn’t do justice to its placid beauty. Once across the rock-laden river, the switchbacks began. I was more surprised about the excellent condition of the trail than its sudden steepness. A light breeze kept the insects away as I forged ahead beneath the leafy canopy high overhead. It was comfortable walking in the shade of both the forest and the quartzite cliff, thrust upright from its original horizontal position millennia ago. I had the trail to myself until some early morning hikers passed me on their way down. I made it to the viewing platform in 40 minutes. The sun’s strengthening light bathed the valley below and the mountains beyond. The businesses, houses and vehicles all looked like toys. Just as I stepped onto the viewing area that protrudes away from the rock face, a southwest breeze picked up. Soon Turkey Vultures began to soar on the developing vortexes. I glanced back down to the river to discover an adult Bald Eagle had also started to circle in the quickly warming air. In just a few elongated loops, the magnificent bird was high above my head. I think I smiled all the way back down to the car. I moved to a shaded picnic table to rest and eat the light lunch I had packed. 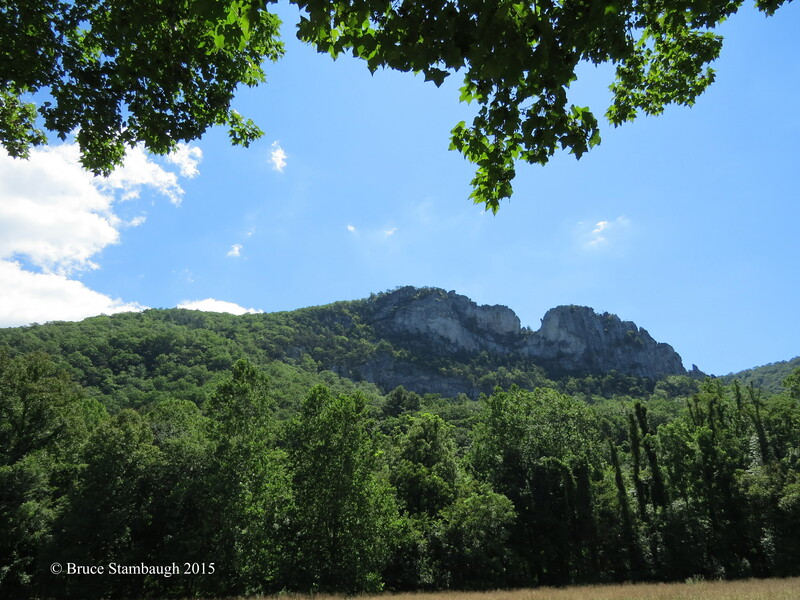 As I ate, I scanned the still shaded western face of the Seneca Rocks with my binoculars. 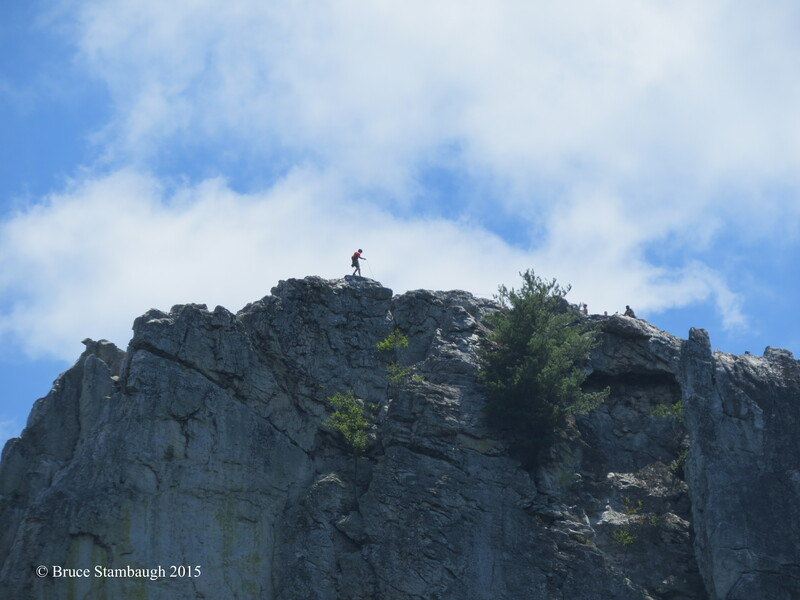 Instead of birds, I found first one, then three, then 10 rock climbers scaling the huge, craggy outcropping. I was entranced. I sat beneath a shade tree observing these men and women pick their way up this sacred place. One brave guy didn’t even use ropes. I waited to leave until all had made it safely to the summit. I admired their courage, their determination, and their adept skills. I was pleased to have walked to the top and back. It was even more satisfying seeing these remarkable folks reach their destination. They celebrated their perilous journey with fist pumps and shouts of joy that echoed far across the valley into my soul.